What's in a Pneumatic Solenoid Valve? I’ve been writing about industrial products and processes for a while now, and few topics have eluded my understanding more effectively than solenoids. Nothing about the word “solenoid” gives away anything about what a solenoid is or does, at least not in the way that the words “aluminum tube” or “overhead crane” or “conveyor” betray meaning. When the regular dictionary’s definition isn’t enough (it’s “an electric conductor wound as a helix with small pitch, or as two or more coaxial helices, so that current through the conductor establishes a magnetic field within the conductor,” by the way), I hit up my last resort: the Oxford English Dictionary’s Online Etymology Dictionary. “Solenoid” is derived from the Greek word for pipe or channel (solen) and the word for form or shape (eidos). 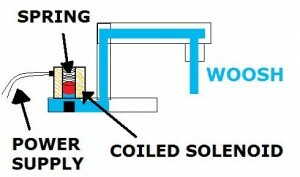 If you take a look at the image of a solenoid below, the word’s etymology makes sense. 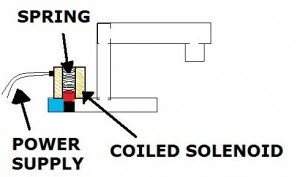 A conceptual drawing of a solenoid. What could such a thing possibly be used for? Light bulb filament? Robot finger trap? Helical coils like this one are used for a variety of purposes. Engineers refer to this coil as a solenoid when it’s used to create motion in some kind of mechanical assembly. One of the most common solenoid assemblies is the solenoid valve. A valve is any mechanical device that is used to control the flow of something, usually a gas or liquid. Technically, your kitchen and bathroom faucets are examples of valves. When you open the valve, it causes a seal within the faucet to become open, which allows for the flow of the pressurized fluid on the other side of the seal to pass through the faucet. A large number of industrial and commercial processes involve getting gas or liquid from one place to another, and each of these processes requires the use of a valve. Imagine a soft drink bottling company. It’s easy to understand how important valves would be in such places. Each bottle has to be filled individually, which means that the flow of soda into those bottles has to be controlled as each bottle is ready to be filled. On and off, on and off, on and off, all day, every day, the flow of product into its packaging has to be accurately and constantly regulated. This is not a job for a human; people become fatigued and distracted easily when performing those kinds of repetitive tasks. Automated systems are much better suited to executing those kinds of tasks. Solenoid valves image courtesy of Magnatrol Valve Corporation. So, in response to the problem of fluid flow control, the solenoid valve was devised. Very simply put, a solenoid valve can be used to automatically control the flow of something. They can control pressurized air in paintball guns, water flow in dishwashers and fuel flow in engines. 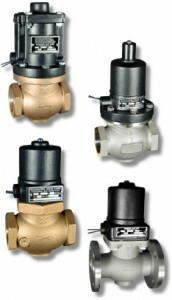 Specific solenoid valve varieties are often named based on how they’re used. When a solenoid valve is used to control the flow of hydraulic fluid, it’s described as a hydraulic solenoid valve. When a solenoid valve is used to control the flow of pressurized gas, the valve is referred to as a pneumatic solenoid valve. How do they do all of these things? Read on. If you look back to the image of the solenoid earlier in this article, notice the two wires protruding from each end of the solenoid. When those wires are connected to a power source and an electrical current is applied, an electromagnetic field is generated. Now imagine that the solenoid is wrapped around a hollow metal cylinder of about two inches in width, one of the ends of which is closed (basically, you’re imagining a thin metal shot glass). Now imagine that you’ve set the cylinder on its closed end. Imagine that you’ve placed a spring that’s just wide enough to fit inside the cylinder on the closed bottom. Now imagine that you’ve placed a solid cylinder that’s just wide enough to fit inside of the hollow cylinder on top of the spring. If you push on the solid cylinder, the spring is compressed and the solid cylinder moves down into the hollow one. Here’s where the solenoid comes in. A simple diagram of a kitchen faucet with open hot and cold valves. A faucet controlled by an open solenoid valve. A faucet controlled by a closed solenoid valve. Of course, there’s probably no reason why you’d need a solenoid valve in your kitchen sink. But if you owned a company that packaged beverages, they could be a necessity. Once you’re familiar with what a solenoid is, and once you’re familiar with some examples of how they’re used, they’re not so confusing after all.